If you’ve noticed an air of festivity in Estonia, it’s because Estonia was celebrating its 100 year anniversary on February 24, 2018. 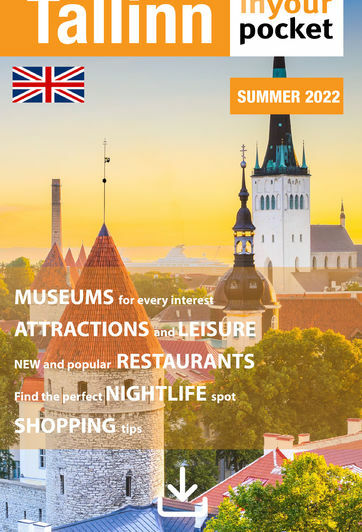 Tallinn In Your Pocket is celebrating too. Until February 2020, we’ll publish 100 fun and interesting facts about Estonia. Started in 2014 by the co-founders of Skype Janus Friis and Ahti Heinla, Starship Technologies developed the world’s first self-driving delivery robots, some of which can be seen driving around Tallinn’s outer suburbs. According to some sources, St. Olaf’s Church was once the tallest building in the world from 1549-1625. In 1590, the height of the church tower was 125 metres and has been hit by lightning around ten times. The church has also burned down three times since its building in the 1200s. The Seaplane Hangars at that now house the Seaplane Harbour Museum, were built between 1916 and 1917, as part of Peter the Great’s sea fortress. The hangars were unique at the time, as they were the world’s first reinforced concrete shell structures of such a great size. Charles Lindbergh even landed there in the 1930s. Estonians are not afraid to try new things and that can certainly be seen with all of the startups that, well, started in Estonia. Some of the more famous ones include: Skype, Transferwise, Pipedrive, Cloutex, Click & Grow, Grabcad, Erply, Fortumo, Lingvist, Taxify, Funderbeam and more. Minox’s subminiature camera, otherwise known as a “spy camera”, was developed in 1936 by Baltic German Walter Zapp, while living in the Estonia. Minox stills exists today and is producing optical and photographic equipment. Every country has its own share of Christmas customs, some of which may seem a little strange to foreigners, and Estonia is no exception. Instead of leaving milk and cookies out for Father Christmas, Estonian children leave slippers on the window sill for the elves, who will, in return leave sweets in the morning. Traditional Estonian Christmas food includes blood sausage, usually served with lingonberry jam and sauerkraut, sült (head cheese), roasted pork and potatoes. Many restaurants in Tallinn prepare special Christmas menus for the holidays where you can try some of these local delicacies. Blood sausage and sauerkraut can also be tasted at the Christmas Market in the Town Hall Square, along with a hot cup of glögg (mulled wine). During the Soviet period, many holidays, including Christmas were banned. Estonians celebrated näärid instead. Although church was also banned, many Estonians still attended in secret on Christmas Eve and celebrated Christmas unofficially in their homes with close friends and relatives, usually behind closed curtains. There has been a long debate over who erected the first Christmas tree, Tallinn or Riga. We’re not going to take sides, but some historical sources report that in 1441, the Brotherhood of Blackheads brought trees into their guild houses for the holidays in Reval (Tallinn). On the last night of holiday celebrations, the tree was taken to the Town Hall Square. This tradition still continues today in Tallinn’s Town Hall Square. If you’re looking to get your own tree this holiday, download the RMK mobile app, which shows you where you can cut your own tree from the state forests. Afterwards, you’re asked to pay a small fee, by internet bank transfer of course, and voilà, the tree is yours! Pööripäev or Winter Solstice is the shortest day of the year in Estonia, taking place on 21 December. On the solstice, there are only 6 hours of daylight, whereas in summer, the longest day of the year has 18 hours of daylight. A common tradition on New Year’s Eve is õnne valamine or the ‘pouring of luck’. Lead is melted over a stove in a metal ladle and then poured quickly, or slowly into ice cold water. What appears are interesting lead figures, which can then tell you your fortune for the upcoming year. The coldest months in Estonia are January and February, where temperatures can drop down to -35C. The coldest temperature ever measured in Estonia is -43.5C, recorded in eastern Estonia on 17 January, 1940. Estonia is a small nation, but did you know that only three cities have a population greater than 50,000? Tallinn, Tartu, and Narva take the prize for largest cities. Every year thousands of skiers gather in Otepää for the annual Tartu Marathon. The marathon is part of the international Worldloppet cross-country skiing series and offers two distances - 63km and 31km. There are even special activities for kids too! Estonia is not all flat land. Its highest point is Suur Munamägi (Big Egg Hill) standing at 317,2m. Suur Munamägi is also the highest point in the Baltics, something which Estonians are very proud about. Did you know that you can drive on the ice in Estonia? That is if it’s cold enough. During particularly cold winters (like the ones we used to have) you can drive between some of Estonia’s islands. The roads are marked with signs and speed limits. You may have noticed that it’s quite dark this time of year, but there’s a little bit of light that comes from the fluttering reflectors (helkurid) that are attached to everyone’s coats and bags. Lots of children wear them, but it’s mandatory for adults as well. Estonian wooden house manufacturers are among the biggest exporters of wooden houses in Europe. Estonian companies export 85-90% to Scandinavia, Germany, and the UK, as well as Japan, South Africa, and South Korea. Estonia has considerably more women than men – for every 100 females, there are 84 men; only the Northern Mariana Islands have a smaller percentage of men. Have you ever heard about the fifth season? Soomaa National Park is best known for its great flood or “fifth season”, when the water from melted snow and heavy rains floods the forest. Eno Raud’s children’s books ‘Naksitrallid‘ and ‘Jälle neid naksitrallid‘ are the most translated Estonian books. You can read about the adventures of Muhv, Sammalhabe, and Kingpool in Bulgarian, Georgian, English, Latvian, Lithuanian, Eastern and Western Mari, Romanian, Norwegian, Polish, German, Slovak, Finland, Danish, Czech, Ukrainian, Hungarian, and Russian. Estonia’s largest factory, Krenholm, began operation in 1858. By 1913, the company employed 10,200 people, making it Europe's largest textiles factory, at the time. The factory complex, which altogether was close to half a million square metres, housed a school, chemist, sauna, churches, hospital, cemetery, and even its own police force and jail. Being an ancient maritime nation, the Estonian coastline is dotted with historical lighthouses that continue to top world listings for most spectacular architecture. The oldest lighthouses in Estonia have stood strong and guided seafarers of all nations since the 16th century. The world’s oldest continuously operating lighthouse is located in Kõpu, Hiiumaa. Seven lighthouses are open for visitors. Tallinn can be regarded as an Olympic city. In 1980, when the summer Olympics took place in Moscow, the Olympic regatta was held in Tallinn. Estonia is only slightly bigger than Denmark and has a coastline fragmented with islands. Estonia has 2222 islands, of which 318 are larger than a hectar. Twenty two islands are inhabited year round. Fact: Estonians love sprats. If you want to try something truly Estonian, pick up a tin of vürtsikilu and eat them on black bread. The first meal consumed in space was prepared in Estonia. A factory in Põltsamaa became the caterer to the Soviet space programme in 1962 and started packaging ready-made food into tin tubes, the only available means at the time. The wolf is one of the most popular animals in Estonian folklore; there are over 500 names and stories about this animal. So, it’s only appropriate that the wolf was chosen as Estonia’s national animal this year. One of the biggest meteorites to hit the Earth in the recent history landed in Saaremaa, in what today is the village of Kaali. Saaremaa is also where, according to one measurement, the centre of Europe is located. Over 50,000 Estonians, comprising about 5% of the population, have a personal gene map, providing hints about risks of hereditary diseases, as well as many other ailments. Furthermore, the Estonian Genome Centre now aims to collect the genetic data of 100,000 people and integrate it into everyday medical practice. Smoke sauna. The Võru smoke sauna tradition is in the UNESCO Intangible Cultural Heritage of Humanity list. The tradition, known as “suidsusannakombõ” in the local dialect, is an important part of everyday life in Võru, a 75,000- strong community located in southern Estonia. Marzipan is one of the oldest sweets made in Estonia, first used as a medicine as it was thought to have healing properties. There are still six marzipan painters left in Estonia, thought to be some of the last professional marzipan painters in Europe. Estonians invented their own sport – kiiking. It involves a swing with its arms made of steel to enable a person to swing 360 degrees going over the fulcrum of the wing. In the sport, the person able to swing over the fulcrum with the longest swing arms, is the winner. The Estonia-wide clean up program Teeme ära! got its start in 2008, when close to 50,000 volunteers cleaned up almost 10,000 tonnes of garbage from Estonia. The trend has caught on and now takes place in over 100 countries worldwide. This year’s Let’s Do It! World takes place on September 15. The Tallinn Town Hall is Northern Europe’s only preserved Gothic city hall. Raeapteek in Tallinn is the oldest town council pharmacy in Europe and the oldest continuously operating medical institution in Estonia. Look for the swallow symbol on food packets throughout Estonia. It’s given to products that are of 100% Estonian origin. In 2017, it became apparent that Estonian food was among the cleanest in Europe, meaning that it uses the least amount of pesticides, according to an EFSA report. Estonia’s tallest tree was recognised in 2005 in Põlvamaa at 48.6 metres tall. The Riigikogu is the parliament of Estonia. The number of the Members of the Riigikogu – 101 – is the approximate cube root of the number of the Estonian citizens with the right to vote. Its members are elected at general elections for a term of four years. The Riigikogu passes laws and resolutions, exercises parliamentary supervision and ratifies international agreements. Estonian language in schools - Bengt Gottfried Forselius was a founder of public education in Estonia, author of the first ABC-book in the Estonian language, and creator of a spelling system, which made teaching and learning Estonian easier. In 1686, an ABC-book devised by him was introduced into use in Estonian schools. Have you heard of these famous Estonians? The Järvi family is Estonia’s most musical family. Paavo, Neeme and Kristjan are all celebrated conductors and have each been nominated for Grammys. Paavo has won two Grammys, in 2006 and 2003. Estonians like black - black bread and black humour. When Estonians express that something is good, they use the word “normal”. E-Residency is a new digital nation for global citizens, powered by the Republic of Estonia. Estonia is the first country to offer e-Residency, a government-issued digital ID available to anyone in the world. Õismäe, Kakumäe, Keldrimäe, Kivimäe, Maarjamäe, Rahumäe, Sõjamäe, Tõnismäe - though the city itself is rather flat. Tallinn received its city status in 1248. Tallinn’s Old Town belongs to UNESCO’s World Heritage List. Estonians are bookworms. According to a recent study by the Australian National University and the University of Nevada, Estonians top the world average of the number of books people own. On average, Estonians own 218 books per household and 35% of respondents own 350 books or more. Estonia’s national pastime is foraging. Everyone is allowed to pick and eat whatever they find in government-owned forests. Next time you’re wandering through the woods, look for raspberries, strawberries, blueberries, mushrooms and more. March 29, 2004 marks the date that Estonia joined NATO and May 1, 2004 is when Estonia joined the European Union. Estonia’s famous liqueur Vana Tallinn was invented in 1962. The recipe of this rum-based drink is still a secret today. During the Crusades, Estonia was named Maarjamaa (Terra Mariana). Two seperate crusades were declared against the pagan tribes of the present-day Estonia and Latvia by Pope Celestine III in 1195 and Innocent III in 1198. The blue, black, and white national flag of Estonia was first adopted on November 21, 1918 after the country’s independence, but dates back to September 17, 1881, when it served as the flag for the first Estonian Student Society Vironia. It was Estonia’s flag until 1940 when the Soviet Union occupied Estonia. The flag was re-adopted on August 7, 1990, almost a year before Estonia regained its independence. series was finally completed in 1936.
International Women’s Day is widely celebrated in Estonia, especially among Russians. Before independence, International Women’s Day was used to show women their supposed importance in society. It was quite a big celebration. Now, like many aspects of the Soviet past, there’s often great effort to create distance between the past and present. Not that most women don’t like to receive flowers and candy though, so don’t feel bad if you wish to give one or both of these items to an Estonian woman on this day. Vana-Võromaa sõir/Setomaa sõir (a type of cheese) is listed in the EU’s Traditional Specialties Guaranteed (TSG) registry, meaning that only cheese created according to a specific recipe can be called a sõir. National parks are areas of particular national importance, established to protect nature and cultural heritage. Estonia has six national parks: Lahemaa, Matsalu, Vilsandi, Soomaa, Karula and the newest, Alutaguse. In addition to national parks, Estonia has many nature reserves and protected natural areas to protect endangered species and natural landscapes. The Livonians, an ancient Finno-Ugric ethnic group, once lived along the Latvian Baltic coast. Their native language, Livonian is similar to Estonian. Unfortunately the last native speaker died in 2013 and the language is nearly extinct. Lennart Meri (29 March 1929 – 14 March 2006), served as the second president of the Republic of Estonia from 1992-2001. He was among the leaders of the movement to restore Estonian independence and was one of the leading architects of the post Cold War world, among other things. 29 March 2019 would have marked Meri’s 90th birthday. In 2009, in honour of his 80th birthday, Tallinn’s airport became Lennart Meri Tallinn Airport. Paiste cymbals were first produced in St. Petersburg by Estonian musician Michal Toomas Paiste. The business expanded, despite many interruptions of war, to Tallinn, then Poland, Germany, and finally in Switzerland in 1957. Today Paiste is the world’s third largest producer of cymbals and still remains a family-run business. The recently released film Truth and Justice (Tõde ja Õigus) is the most-viewed film in Estonian cinemas, with over 205,000 views, and it’s still running in cinemas. The film is based on a famous book by Anton Hansen Tammsaare and is believed (by Estonians) to represent the true Estonian character. The oak tree in Orissaare was named European Tree of the Year. It’s unique because the tree sits in the middle of Orissaare Stadium. According to Google’s interactive Photos app, Alexander Nevsky Cathedral is the most photographed site in Tallinn. Did you know that the land on the eastern shores of the Baltic Sea were the last corners of Europe to be Christianised? Although most people know about the medieval crusades to capture the Holy Land, few people realise that separate crusades were declared against the pagan tribes of present-day Latvia and Estonia by Pope Celestine III in 1195 and Innocent III in 1198.